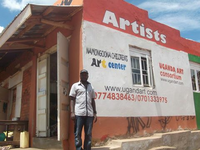 March, 2015...the Namungona Children's Art Center opened in a converted shipping container, staffed by Uganda Art Consortium volunteers James Nsamba and Farouk Mukwaya. Over two thousand Ugandan children have taken part in our free workshops since we started in 2008. Now we have our own building.